This week Prime Minister, Theresa May, told the House of Commons Liaison Committee that the UK could have frictionless trade with the EU, without being in the Single Market or the EU customs union. 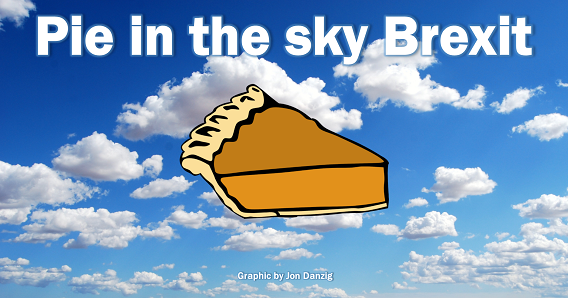 SNP MP, Angus Brendan MacNeil, told the Prime Minister that her plans were “pie in the sky”. Not only is he right, but Theresa May knows her Brexit plans are pie in the sky. Yet that’s exactly what Mrs May now wants. She says she aims to achieve a new trade agreement with the EU that’s unique to us, that no other country in the world has ever achieved. Of course, it’s not going to happen. The EU most certainly will not accept Mrs May’s pie in the sky proposals. So here’s the bottom line. Britain needs frictionless trade with the EU. We need free movement of goods, services, capital and people for our country not just to survive, but to thrive. We need to continue with the status quo: the arrangement we have now. Has this sunk in yet? We’re leaving all the benefits of the EU, only to desperately try and get back as many of those benefits as we can after we’ve left. We’re going to pay around £40 billion (the so-called ‘divorce settlement’) – money that will come from us, you and me – to try and achieve what we’ve got, but less of it, and on considerably inferior terms. This is complete and utter madness. It will be much better to just keep the current arrangement. It will be cheaper, and we will all be better off. ① We have a say and votes in the running, rules and future direction of our continent. ② We have full and free access to the world’s largest free marketplace. ③ We enjoy the right to live, work, study or retire across a huge expanse of our continent. ④ We enjoy state healthcare and education when living and working in any other EU country. ⑤ We enjoy free or low-cost health care when visiting any EU nation. ⑥ We are protected by continent-wide rights that protect us at work, when shopping and travelling. ⑦ We benefit from laws that protect our environment (and have, for example, directly resulted in Britain’s beaches being cleaned up). ⑧ We enjoy excellent EU trade agreements with around 60 countries, with more on the way, on advantageous terms that Britain is unlikely ever to replicate. So, we’re going to throw that all away, just so we can get an inferior arrangement with the EU, in which we’d still have to agree to the rules of EU trade (over which we’d have no say) and we’d have less access to our most vital customers and suppliers outside of our home market. We are leaving for no good reason, not one. We are paying around £40 billion (money the UK has agreed we owe to the EU) to settle our debts with the EU, to enable us to have an inferior deal. We will be poorer, and with less sovereignty, fewer rights and protections, restricted trade, and diminished power after we’ve left. What’s the point? There’s no point. There is no pie. There is no cake. There is no Brexit dividend. There is no Brexit that can work.